The following article was inspired by a dialogue between three groups of people: 1) researchers into the UFO and crop circle activity, which has drawn increasing attention in recent years, 2) Native Americans, whose prophecies point to the current times as being a critical turning point for humanity, and 3) a growing body of people whose spiritual teachings predict the return of a Great Teacher/Messiah/Buddha/Elder Brother at this time. Here we attempt to correlate their ideas, postulating that there may be a unifying theme between them, and that many of the ‘unexplainable’ phenomena that are now happening daily in our world — spontaneous healings, weeping and bleeding statues, miracle waters, milk drinking statues, visionary experiences, and extraterrestrial activity — are signs that humankind is on the verge of a tremendous evolutionary advance — one that will be aided by the ‘angels’ and ‘guardians’ who some claim are always with us, protecting our earth and guiding our every step. First we will discuss the ideas of some native leaders, and then look for parallels in the thoughts of Benjamin Creme, a British esotericist, who has written and spoken of these phenomena for over 20 years. Until recent years it has been a controversial step for native leaders to publish their prophecies, but many are now coming forward because the prophecies themselves contain a directive to go out and warn the world when certain signs appear. Signs such as the ‘rain of fire’ and ‘gourd of ashes’ (atomic warfare) and the ‘shaking of the earth’ (earthquakes) are seen as indications that it is time. 1) We are entering a time of purification and can expect to witness chaos and destruction in all the kingdoms of nature. 2) It is a time for the reuniting of the races. Barriers of religion and nationality will begin to fall as all people realize their essential unity. 3) We must heal the damage done to Mother Earth, the source of life, and recognize that all living things are endowed with spirit. 4) In the coming times we will see the return of one or more Great Teachers who will guide us into the future. Through the legends of the native peoples of North and South America, there runs a recurring thread — the tale of a Great White Teacher who came in ancient times to free the people from slavery, war, and human sacrifice. He showed them instead, a way of peace, dignity and brotherhood. He brought prosperity to the poor tribes by introducing agricultural methods and ways of self sufficiency. He renovated their patterns of worship, and taught them a special reverence for Venus, the Morning Star, the object of His daily meditations. From Alaska to the tip of South America His story can be found. His names were many: Tah-co-pah, the Healer; Ee-me-shee, the Wind God; Chee-zoos, God of the dawn light. Today He is best remembered as Quetzalcoatl, the feathered serpent, or Kukulcan. His image graces the resurrected pyramids and temples throughout these lands. The Prophet was bearded, with long hair, and wore white flowing robes. Wherever He went, He trained 12 disciples to carry on His work after His departure. Before He departed He gave a prophecy — that the cultures He had inspired would eventually fall to the tragedy of greed and war. The temples would be burned, the populations decimated. He warned His people to protect their sacred writings, and promised that He would Himself return to restore order and balance and to open again the pages of the ancient wisdom books. When He left, He traveled East, and it is from the East He promised to return. Black Elk and Crazy Horse were leaders of the Lakota Sioux in the late 1800s when the US was decimating its native populations. Each had a vision of the future. Black Elk saw that his people, after long years of destitution and death, would loose heart and the sacred hoop of his nation would be broken. But after seven generations he saw a vision of the nation being reunited and becoming part of the greater hoop of all the nations of the earth. At that time a great Prophet from the east would bring a message of hope to all people. Crazy Horse’s vision also foretold the darkness that would descend on his people. He saw the coming of automobiles and airplanes and the tragic world wars of the modern era. But after the last war, he saw his people gradually awaken and begin to dance again, this time along with people of all colors, under the Sacred Tree of Life. In 1948, Thomas Banyacya accepted the task of warning the world of the events foretold in the Hopi prophecies. The Hopi’s, he says, had been instructed to seek a “house of mica” (glass) that would stand on the eastern shore of Turtle Island (the US). The Hopi’s saw the UN building in New York as the house of mica. Beginning in 1949, they sought entry to its assembly to: 1) look for their True White Brother, 2) seek justice for Indian brothers and sisters and good people everywhere, and 3) warn leaders of the coming purification. In 1992 and again in 1993 they were able to deliver their prophecies. Hopi legend speaks of the Pahana, or the True White Brother, who once lived with the people and would return in the time of Koyaanisquatsi, when the world was beset by fearful troubles and chaos. Then He would unite the broken tribes and reestablish balance and harmony. Don Alejandro Oxlaj, a priest and seventh generation medicine man from Guatemala, calls the times we live in as “crucial for our future survival,” and hopes to alert the world to the momentous changes that he says are now occurring. As head of the Quiche Maya Elder Council, representing 21 Mayan regions, he is a wisdom keeper of the Mayan calendar and prophecies. He has received permission from the Council to publish, for the first time in 500 years, the Mayan prophecies. Hunbatz Men is a Mayan daykeeper, an expert on theological and calendrical systems of the ancient Mayan civilization. He has published sacred teachings that were hidden at the time of the Spanish conquest. He speaks of Kukulcan and Quetzacoatl, not so much in light of an expected return, but rather in terms of the possibility in the coming times for each of us to attain His same exalted stage by treading the path of attaining knowledge. The Lakota Sioux tell of their Messiah, the White Buffalo Calf Woman, who came to the people in a time of great need. She brought the Sacred Pipe and established the foundation of their ritual and social life. When she left, she turned into a white buffalo, and promised to someday return. In 1992 a white buffalo calf, named Miracle, was born in Janestown, Wisconsin. This was considered a sign that the promise was fulfilled. David Gehue, Canadian Mi’kmaq, says we are in the final stages of transition when “The Great Spirit takes the earth in both hands and shakes it violently.” He speaks of a mysterious person in olden times who “came from the rising sun and went to the setting sun.” He warned them of the coming of seven evil cycles when the great white monster “would disperse the people to lives of misery and destitution.” The mysterious brother said he would come back from the rising sun with a new spirit and power that would destroy the white monster. At that time the wisdom of the Elders would again be heeded and life restored to balance. Jake Swamp of the Mohawk nation tells of the Peacemaker, Deganawida, who unified the tribes of the Iroquois Confederacy (an eastern group whose system of laws inspired the Constitution of the US.) The Peacemaker foresaw the events that would destroy the lives and culture of the Confederacy tribes, but predicted that in time there would be born many children who would heal the ancient wounds, and also a great Prophet, a World Uniter, who would renew the spirit of man in a way more worldwide and all-embracing than ever before in history. High in the Peruvian Andes, at 17,000 feet, live a people known as the Q’ero, who fled to higher ground 500 years ago, at the coming of the conquest. Their prophecies have predicted that it is now time for the great mastay, the gathering of the peoples, and for the return of Pachacuti, the builder of Machu Picchu and the founder of the Inca Confederacy, whom they regard as their Messiah. His return to the world in the present era will be on a collective level. “The extraterrestrials are of the White Brotherhood from other planets….In South America there are still physical traces that give testimony to a time when we worked closely with our older brothers from other planets. In antiquity our ancestors — the Mayans, Aztecs, and Incas — received visits from other worlds. The Hopi also claim a long standing relationship with the UFO extraterrestrials. 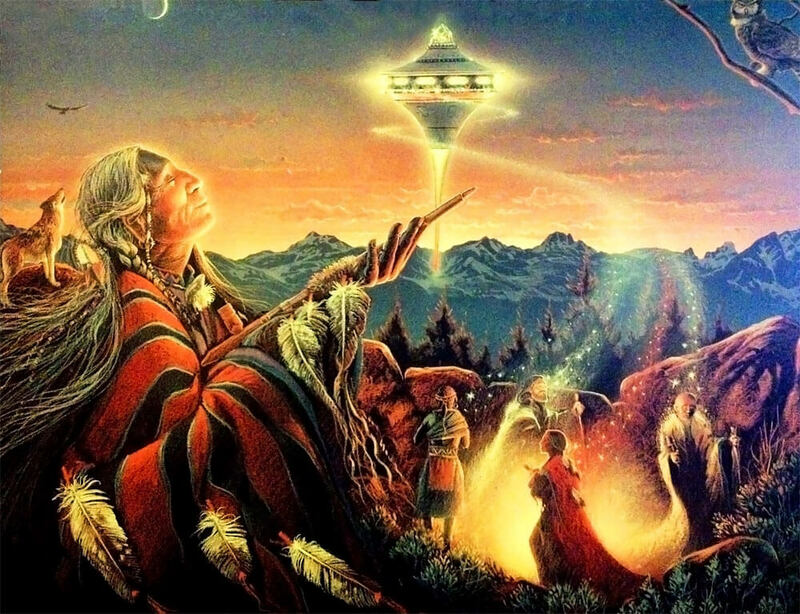 Chief Dan Katchongva (now deceased) said of the UFOs: “We believe other planets are inhabited and that our prayers are heard there.” He connects their presence with the present purification their prophecies have described and with the return of the True White Brother. UFO researcher Paul Solem, who worked with Katchongva, describes their occupants in this way: “There is no reason to fear these people. They are like the angels. They come from the planet Venus and they are here only to lend credence to prophecy, not to harm anyone.” He says the saucer people look just like humans, but seem to be of an almost divine quality. They keep their hair cut neatly to the shoulders. Because of their fine qualities and the almost musical tone of their voices, it is difficult to tell male from female. Since 1975 Benjamin Creme has traveled the world with a unique and singular message — that we are living in an era which will see the return to our everyday lives of highly evolved spiritual teachers. For the next 2,000 years, during the whole age of Aquarius, they will work and live among us, helping us find solutions to our world problems. He claims this information came to him when he was approached, in 1959, by a spiritual personage whom he calls a Master of Wisdom, one of a group of over 60 Masters who oversee the evolution of our earth. The Master told him that the leader and teacher of this group, whose name is Maitreya, will, in the coming years, begin His mission as World Teacher for the Aquarian Age. He said that Maitreya is the fulfillment of the prophecies of all religions that predict the return of a Teacher in our day, and that not only Maitreya, but about 40 members of His hierarchical group will return along with Him in physical incarnation. Maitreya’s concern in our modern world is that humanity learn the art of sharing. The present economic disparities that exist between the nations contain, He says, the seeds of a third World War. We must take the steps towards ensuring an adequate livestyle for all of earth’s inhabitants or face the awesome possibility of complete annihilation. If we do successfully make these changes (and He believes that we will), He promises that awaiting us in the future times is an age in which we will begin to express more fully the aspects of Love, Brotherhood, and world unity. Creme claims that Maitreya has been living in the immigrant section of London since l977, and is quietly spreading His energies into the world until the time when He begins His public mission. The following ideas are Creme’s commentary on some of the little understood occurrences in our world. Because he is in constant contact with a Master his comments may give us a view of these events from a spiritual perspective.They are offered, not in a dogmatic sense, but simply as possibilities, suggestions for thought, and left to the discrimination of the reader as to their merit and rationality. Concerning the White God who worked among the cultural groups of the Western Hemisphere, Creme suggests that He was an incarnation of the Master Jesus, in a mission which took place in the 7th and 8th centuries AD. Maitreya’s connection with Jesus is that He is the entity who overshadowed the disciple Jesus from the baptism to the crucifixion. After His death in Palestine, Jesus was reincarnated as Apollonius of Tyana and, in His next incarnation, as the ‘Christ of the Americas’. He profoundly influenced the cultures of two continents. UFOs — From Whence Do They Come? Creme says that all the UFO’s are from our own solar system, mainly from Venus and Mars, and “number in the thousands and even millions.” Every planet in our system is inhabited and each has a Spiritual Hierarchy, but because the inhabitants exist in etheric matter, they are invisible to human eyes. We have a very close affiliation with Venus because in our early evolution it was responsible for the implanting of the quality of mind or manas in humanity. The spacecrafts also exist in etheric matter, and are normally invisible. We are able to see them because the pilots can lower the vibrational level of the ship. Creme calls them Space Brothers and claims they look similar to us because they belong to the human branch of evolution, which exists on all of the planets. One beneficent service they perform is to counteract the effects of radiation released by our testing, chemical spills, and careless use of radioactive substances. They have ‘implosion’ devices which neutralize the effects, and without their help we would be in a very sad state. Their activities in relation to earth are part of a preparation for the coming age, which is crucial for our evolution. What happens here affects not only our own planetary existence but that of the other planetary bodies in our system as well. The physical manufacturing of the ships is a combined effort of the inhabitants of Venus and Mars, who, “have visited this planet for countless millennia and are very closely concerned with the externalization of our Spiritual Hierarchy into the world.” As Venus is the more highly advanced of the two, it offers the design. Mars, as the great ‘factory’ planet, actually manufactures them. They are made by a combination of thought and very high technology, far beyond anything we know about today. Creme says the crop circles are all created by UFOs and are closely connected with the work of the Hierarchy. The specific purpose of the circles is to recreate the ‘grid’ of the earth’s magnetic field on the physical plane. Each circle is a chakra, or vortex of magnetic energy. They are all ideograms and echo symbology used in the time of Atlantis. They “will become ‘batteries of energy’ for humanity in connection with a new energy source, part of the science of light which lies just ahead for humanity.” Most of them have been created in England to call attention of the world to the country where Maitreya has begun His mission, but they can be found all over the world.